TopStep, the home of pool safety, has a core focus on child drowning prevention in swimming pools however other common drowning risks in the home as w ell as in natural bodies of water like rivers, dams and the ocean must be taken into account at all times. Be aware that a child can drown in: swimming pools, lakes, rivers, oceans, springs, ponds, creeks, ditches, reservoirs, swamps, floods, bathtubs, toilets, washing machines, five-gallon buckets, sinks, portable “baby” washtubs, portable “kid” pools, portable spas, fish tanks, animal watering troughs, mop buckets, water parks, food, rimless tires and dog bowls. Familiarise yourself with some of the unique risks of child drownings in these circumstances as well as the safety tips to avoid such tragedies. Be aware that people of different ages drown in different locations. For example, most children ages 1-4 drown in home swimming pools. The percentage of drownings in natural water settings, including lakes, rivers and oceans, increases with age. A good rule for supervision around any body of water is to practice “touch supervision”, which means being close enough to reach the child at all times / within arm’s length. NB: Supervising adults should never drink alcohol or be under the influence of drugs. Alcohol influences your balance, co-ordination and judgment. For children, as little as 2.5 cm of water poses a drowning risk. The disproportionate weight of their heads means toddlers can easily topple over and find it difficult to lift their heads to breathe. With infants under one year, most drownings happen in the bath when the child is left alone for a few seconds. Never leave a child under four alone in the bath. If you must leave the bathroom, take the child with you. Drain the bath after use and never leave the plug in even when the bath is empty. Be aware that baby bath seats do not prevent drowning. Keep the bathroom door closed. Install a safety latch or doorknob cover on the door and never leave the key on the inside. Always shut toilet lids. Consider installing childproof locks on the toilet lid. Nappy buckets, drums, and other large containers of water must be covered and inaccessible to children at all times. 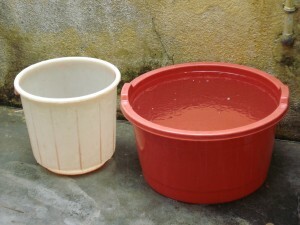 Store buckets safely and don’t leave them outside where they might accumulate water. If you have a pond, cover it with a sturdy mesh. Covers your spa/Jacuzzi with a tamperproof solid safety cover. Don’t leave deep/large bowls of water out for pets, or place pet drinking bowls in areas that are not accessible by children. Don’t leave bowls under dripping/leaking taps. Swimming conditions can be unpredictable in ponds, lakes, rivers and oceans. In natural water, the depth can change rapidly, as can water temperature, currents and the weather. Murky water might also conceal hazards. Don’t let children swim alone or without adult supervision. 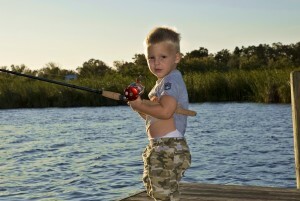 Children should wear a life jacket near all natural water and also when fishing from the shore. Always enter natural water feet first. Don’t let children dive in. Check the water temperature before swimming. Icy water can cause shortness of breath which leads to panic. Never allow children to swim in drainage ditches or other water-filled areas not intended for swimming. Never allow a child to play in flood waters, no matter how shallow the water may seem. Children should always swim with a buddy and be discouraged from playing pranks or jokes in the water. River currents are often stronger than they appear. If you are unsure of how strong the current is, throw a stick in the water to check how fast the water is moving. 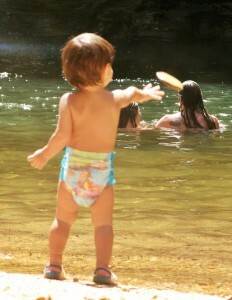 Teach a child, if caught in a current, to float on his/her back downstream with their feet first to avoid a head injury. If possible, they should angle their body towards the shore/banks. After heavy rains, streams and rivers quickly change and without warning. A place that might usually be safe to cross a river may be dangerous even after light rain in the area. Find a safer point to cross in the rainy season. Don’t allow children to play on river banks. They can crumble easily, and are often slippery. Sharp rocks and branches can also cause head injuries if they fall on the banks, causing them roll into the water. At the beach, only swim in designated areas and preferably always with a lifeguard on duty. Learn about the beach flags and what danger level is represented by each different colour flag. Be aware that these can differ from beach to beach. 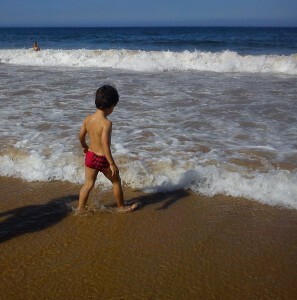 Don’t allow children to stand with their back to the ocean as a sudden wave can knock them over. If caught in a current, the child should try to try to swim parallel to the shore. Once free of the current, they should swim diagonally toward shore, or they should tread water until help arrives. Check the weather forecast before letting children swim in the ocean or rivers/streams. Never let them swim in strong winds or during thunderstorms. Know the signs of rip currents. Some signs are: water that is discoloured and choppy, foamy, or filled with debris and moving in a channel away from shore. Never let a child swim in or paddle near rip currents. Most importantly, make sure every adult in the home knows the correct CPR steps for cases of child drowning. Start CPR as soon as the child is rescued and don’t stop until medical assistance arrives. This can make the difference between life, brain damage and death.